Having seen both films, I can now confirm that White House Down is the Dante's Peak to Olympus Has Fallen's Volcano. If that analogy doesn't make sense, (a.) you might be too young to see something with this much violence and (b.) all I'm trying to say is that if you see one brainless action flick in which the President and a Secret Service agent/wannabe Secret Service agent save the country from terrorists, then White House Down is the film for you. This type of material is in good hands with director Roland Emmerich, he of Independence Day fame. This is probably his best film since that 1996 blockbuster, and while it was a dog at the box office this summer, it deserves the kind of tongue-in-cheek fondness that endures to this day for ID4 -- a film that, apologies to my fellow Millenials, is awful, objectively speaking. 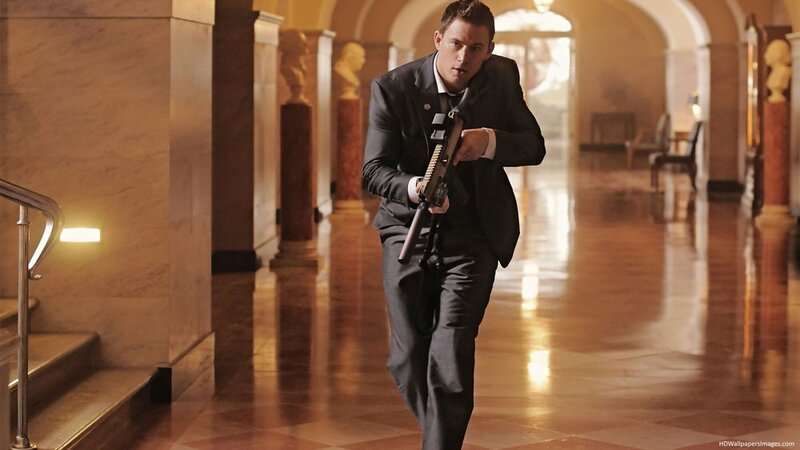 The charm of White House Down lies primarily with its stars, Channing Tatum and Jamie Foxx. Tatum plays John Cale, a veteran of the war in Afghanistan who dreams of joining the Secret Service but is rebuffed early in the film when he interviews for a position at the White House with Carol Finnerty, who is played by Maggie Gyllenhaal. In the wake of his failure, Cale takes his teenaged daughter Emily, played by Joey King, on a tour of the White House and before long he ends up being the only person who can protect Foxx's President Sawyer from a treasonous plot led by Secret Service head Martin Walker, who is played by James Woods, and a team of mercenaries helmed by Jason Clarke's Emil Stenz. Woods and Clarke, though not always working perfectly in concert, are reminiscent of the betrayed military men led by Ed Harris in The Rock. Tatum and Foxx, meanwhile, share a great repartee that is not unlike the Will Smith-Bill Pullman relationship in Independence Day, Tatum the working-class hero like Smith and Foxx the dignified executive like Pullman (but with a smidge more of an edge). I'm not telling you not to watch Olympus Has Fallen. I'm not sure what your capacity is for action movies with a very familiar premise is. What I am telling you is that White House Down is better in every single facet. Its villains are better drawn. Its heroes are more human and likable, especially Tatum who, improbably, just seems to keep growing on me.